The following obituary of Gerard O’Flanagan appeared in the Morning Bulletin (published in Rockhampton, Queensland, Australia between 1878-1954) on Saturday 21 April 1951 (p. 6). A letter O’Flanagan sent to the Connacht Tribune in 1916 while recuperating in England has previously been reproduced on ‘Galway Rising.’ There is a small error in the obituary below: his address should read ‘Lissadyra, Tuam.’ The obituary and O’Flanagan’s Australian enlistment form was kindly sent to ‘Galway Rising’ by Anne Tierney (President of the Old Tuam Society). Anne has carried out much research into Gerard and the O’Flanagan family of Lissasdyra. Her study was published in the Journal of the Old Tuam Society 2 (pp. 58-63). The death occurred on March 30 last of Mr. Dennis Gerald O’Flanagan, aged 74, a well-known identity throughout the Central-West. Mr. O’Flanagan was born at the family home of “Lysidia”, Tuam, Galway, Ireland, the youngest of a family of six. He was educated at the Dublin University. As a young man he joined the British Army and served with distinction with the Queen’s Mounted Light Infantry throughout the Boer War. On discharge from the army he was appointed to the Justice Department in the Transvaal where he became well known as an amateur jockey and horse owner. He migrated to Australia in 1910 and was interested in pastoral activities for three years before coming to Queensland, where he worked in the Longreach district until the outbreak of the Great World War, 1914-1918. 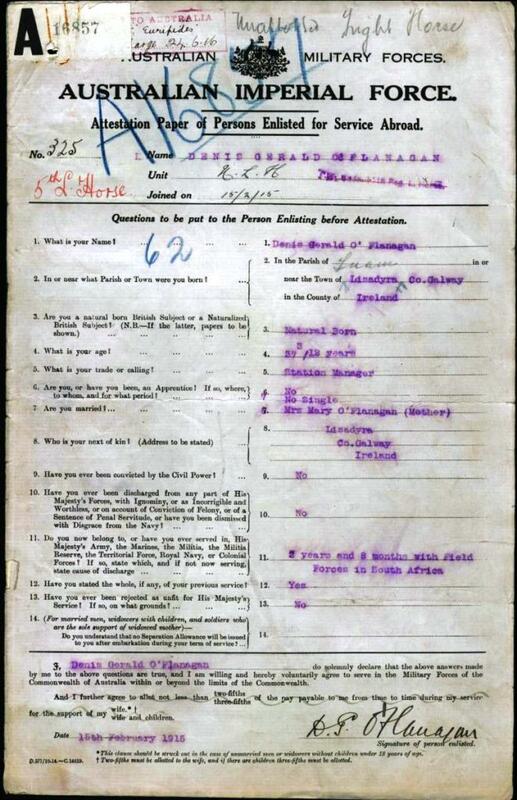 He enlisted in the AIF and went overseas with the 11th Light Horse. He was wounded on Gallipoli. After many months in hospital he was repatriated to Australia. After discharge he served with the Lands Department until 1920 when he bought a property in the Springsure district. In 1920 he was married to Miss I. C. Hamilton, daughter of Mr. J. Hamilton, Moura Station, Banana. During his life in the country he was energetic in his efforts to help the progress of the outback and was prominent in patriotic works during the last war. The last three years of his life were spent at Milman, NCL, where he made a host of new friends. During the last eight months he looked after his son’s property while his son was in Korea. Surviving him are his widow and two sons. One son is at present serving with the Korean force. 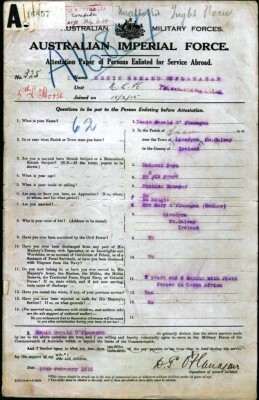 Gerard O’Flanagan’s war records at the National Archives of Australia can be viewed here. Many thanks to Anne for researching and providing history on our family’s history. I am the grandson of the above Denis Gerald O’Flanagan.